Deciduous shrub, loosely branched, 1-3 m tall; stems erect, finely hairy, unarmed; bark brownish to reddish-brown. 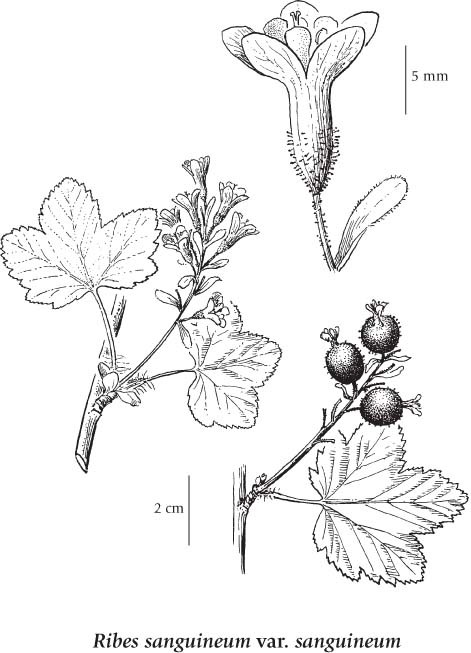 Alternate, broadly kidney-shaped or rounded, shallowly heart-shaped at the base, 2-7 cm wide, equally to irregularly 5-lobed nearly half their length, the lobes rounded, shallowly 2-3 toothed, glabrous above, finely hairy below; stalks equal to or slightly shorter than the blades, finely hairy and sometimes glandular. Inflorescence of 5-30 flowers in a spreading raceme equal to or longer than the leaves; flower stalks 1-5 mm long, jointed below the flowers, glandular; petals light to dark rose, rarely white, egg-shaped, 2.5-3.5 mm long; hypanthium nearly tubular to slightly bell-shaped, 3-5 mm long; calyces pale to deep rose, finely hairy and stalked-glandular; styles fused and glabrous, about equaling the stamens. Berries, round, blue-black, glaucous, 6-9 mm long, usually stalked-glandular. Moist to dry forests and rock outcrops in the lowland and montane zones; frequent in SW and SE BC north to 52degreeN; S to CA. Shade-intolerant, submontane to subalpine, Western North American deciduous shrub distributed more in the Pacific than the Cordilleran region. Species occurs in maritime to submaritime cool mesothermal climates on very dry to moderately dry, nitrogen-medium soils; their occurrence decreases with increasing elevation, precipitation, and continentality. Sporadic to scattered in early-seral communities and open-canopy Douglas-fir forests on water-shedding sites. Characteristic of moisture­deficient sites.